I never thought of the Chicago suburbs as a place worthy of literature. Books, on the contrary, are something suburbanites use, like drugs, to escape the reality of their environment – a dull, slow, lonely locale, without the drama of a big city or even a small rural town. As Dave Eggers notes in his book, A Heartbreaking Work of Staggering Genius (hereafter referred to as AHWoSG), often under the veneer of a safe and calm neighborhood, the spirit of a suburbanite dies slowly. I’ve had this book since high school, just sitting on my shelf. I began reading it when I was eighteen, but, coming off of English classes focusing on Faulkner, Camus, and Sartre, I was sick of authors who played fast and loose with the rules of language, especially to evoke depressing thoughts. I just graduated high school, was looking forward to college, and didn’t need these heavy stories. So I stopped reading after skimming the first few pages. Six years later, I tried reading AHWoSG again, and finished it in the course of a week. I did not realize until this latest attempt to read AHWoSG that a good portion of the book takes place in Lake Forest, IL. In fact, the author grew up there. One of the most influential novels of the decade was written about one of the most boring places on earth. I was inspired by this, this entering of the Chicago suburbs into literary history. There is some beauty here after all, if one has the eyes to see. Having recently read Jack Kerouac’s On the Road, I couldn’t help but compare the two books. The books were very similar in their raw, fluid writing style and their frank depiction of contemporary American life. But there are differences, of course. AHWoSG reads like On the Road would read if Sal Paradise (the protagonist of Jack Kerouac’s work) had never met Dean Moriarty, Sal’s inspiration for travelling. Eggers’ mind turns on itself, at times, revealing its anxieties and paranoias. There is no great odyssey like in On the Road, only the suburban mentality that Eggers can not escape no matter where he moves around the country. Job. Family. Chores. Impressive feats of creativity to stand out from the millions of other impressive feats of creativity in society. Over and over and over. But this is fitting, this boredom and lack of heroism. Eggers shows what it’s really like, delves into the psyche of a suburbanite and exposes it without holding back. Without Dean Moriarty, Sal Paradise too would have lived this dully. Without some kind of uncommon inspiration, the suburbs, where material ambitions replace the need for community, are unbearably soulless places where the mind turns on itself for lack of real problems to solve. And Eggers portrays this well. The plot of AHWoSG, which is autobiographical, centers around the deaths and tragedies (real or imagined) that happen to people close to the author. The author loses his parents in his early twenties to cancer and has to raise his little brother, Toph, on his own. He fears constantly that he (or Toph) will meet an imminent and bloody death. A close friend repeatedly tries to commit suicide. Another friend suffers brain trauma after a balcony collapses and she tumbles four stories to the ground. 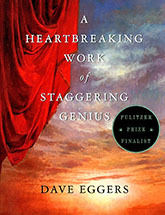 All of these tragic people make it into the author’s narrative, Eggers laments at one point in the book, and the friends, family members and acquaintances that lead a safe and happy life do not. This authorial introspection, let me note, is one of the coolest parts of the book. I’m not referring to the general self-conscious thoughts of the protagonist, such as what he is thinking at this point or that in the story. At a few moments in the book, Eggers does something entirely different: he departs from the story very slightly and lets us see the workings of his actual writing process. Why have I written about this person? he asks and deliberates at one point. Sometimes, other characters cease to speak from their own voice and speak instead as projections of the author’s own thought process. In this way, Eggers’s little brother Toph will suddenly start psychoanalyzing his older brother, but it is clear that at this point the author is having a conversation with himself through the voice of Toph. Eggers really pulls this off well and injects into his story a subtle inquiry into the writing process. The title of the work itself is poking fun at the author’s motivations for writing the book. But for all of its sarcasm and self-consciousness, AHWoSG breaks out of the mold of young adult concerns – it’s not disaffected and predictable. The sarcasm is not there to exhibit the author’s superior intelligence. The streams of consciousness do not sag. There is a narrative and a voice, a story, however unconventional, but something familiar nonetheless. A dirge for the suburbs, with all of their quiet madness, written just so.